Call us on 1-800-864-5625 if you have any queries. It is essential that you understand which stones can be treated in order to remove efflorescence and which cannot. Read the following, call us if there are any queries and make sure you do small test areas. This is YOUR responsibility. What is efflorescence? In the case of natural stone it is a water soluble mineral salt that moves up through a stone in solution. As the solution reaches the surface of the stone the water evaporates and leaves the mineral salt behind. The mineral salts form a white residue that can be difficult to remove without the correct knowledge and products. The mineral salts can originate from within the stone itself. In this case it is a finite issue and once removed it is unlikely to recur more than once or twice. The mineral salts can originate from the cement (mortar) under the stone which can cause a longer term issue but in almost all circumstances it is possible to remove and it will stop after a while. Important. In order to remove efflorescence you need to use a phosphoric acid based product. Do not use standard brick or patio cleaner as this is likely to contain hydrochloric acid which can be disastrous. As a general guide, most sandstones, slates and granites can be cleaned as described below but it remains your responsibility to do the required rest areas. For removal of Efflorescence use AcidClean. If you are concerned that you are not able to identify your stone you should test on spare stone. Otherwise, you should begin on a small area, perhaps just one slab. After rinsing and allowing to dry make sure there is no change to the colour of the slab. As a guide, begin by diluting AcidClean at 1:5 with water (one part product, 5 parts water). 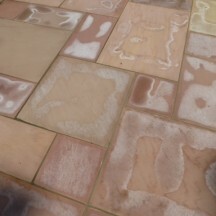 Apply to a stone where you can see efflorescence. You expect to see some "fizzing" as the product works. Lightly agitate with a natural or plastic bristle brush. Rinse after 5 or 10 minutes and check results. Refer to full product guide on the product page.